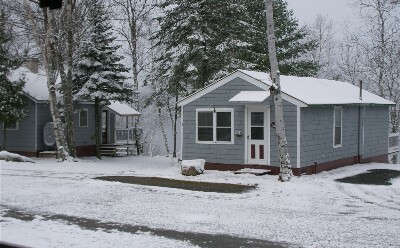 We woke this morning to about an inch or more of snow on the ground and it is still snowing. Our deer hunters are happy campers today! Season opens tomorrow. 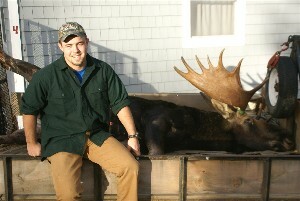 On the last day of Moose season in Jackman, a regular of ours, Chad, stopped in to show us what he got. Nice job! 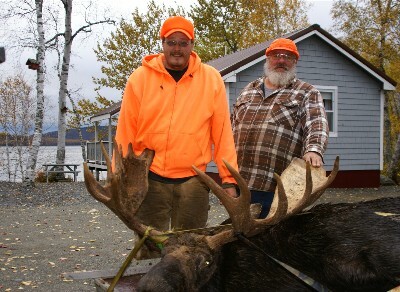 Moose season opened yesterday and 2 of our guests came home last night with their prize. Jordon came in first but they put the bull in the truck head first so a full image was not possible. Later last night the Beck family arrived with their prize. I took these this morning before they left. Nice job boys. Both bulls with the first shot! I believe both weighed in over 1000 (with the insides) so about 700-800 without? Hopefully, we will have a couple more come in today! I checked out Bishops Store, where all the bucks are tagged, and looks like less tagged this year so far compared to last year but MUCH BIGGER BUCKS. Ray said 12 weighed in over 180#. They are now in rut though so expect that more to come. Still have some openings if you hunters want to get your Buck for 2009! Seems to be a slow deer hunting season this year around the region but Kevin was the first of our guests to get his buck. 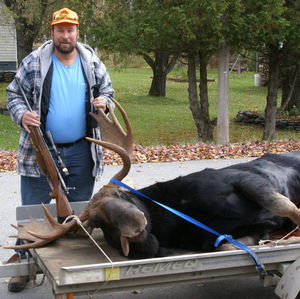 Our guests came back this morning with their Moose…weighed in at a bit over 600 pounds. 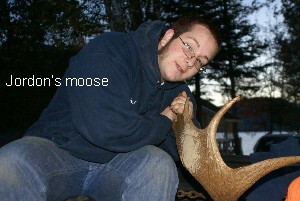 Also, just a note that 4 of the 5 guys in the group are from Maine, the one who shot the moose was from PA, just north of Pittsburgh. Lucky him. Drove through town today and seems to be so much activity in town. Most are wearing orange so must be because of hunting season. 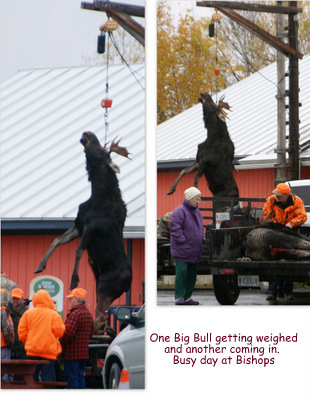 But as I was driving by Bishops Store, I saw this Bull going up on the scale. Most of our guests this year told us that this was the best bird season they have had for many years. One guy said that they saw 50 grouse in the 7 days they were here. Of course, they did not get that many, complaints that the “site was not right” 🙄 But good year. Well this is the end of the 3rd week of deer season and many of the hunters this week were discouraged. This week was incredibly cold, about 20 but a chill factor of about 1. The winds were brutal here on the lake but even worse up in the mountains. Even though we did have some snow, it was not enough. Every step they made was a nice crunching sound. Well, coming soon, I will post proof of at least one 8 point buck roaming these woods! (besides of course, all those tagged at Bishops Store) One of our guests had the high tech outdoor infrared cameras. They mounted them for the week in 2 different spots. He could not look at all of them but did see a gorgeous 8 point buck on a few shots. 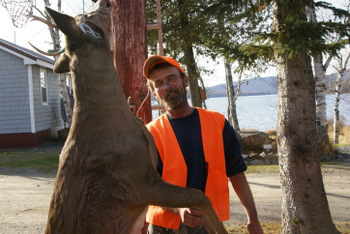 He promises to send me the shots which I will post to PROVE there are still some big bucks in the region. 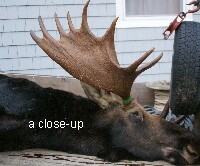 One other thing that they all seem to be saying is they are seeing so many Moose, fox, Minx, families of Raccoons, and other wildlife that they never saw before. SO even though they did not get their buck, they had a great time and appreciated seeing all the other wildlife that they had maybe never seen before.